Are Your New Year's Resolutions Realistic? According to the author of Changing for Good, statistics have shown that at the end of January, around 64% of people who create a New Year’s resolution are still actively working towards their goals. Then around six months later, approximately 44% are still actively working towards their goals. Also, according to the University of Scranton – Journal of Clinical Psychology, 45% of the population makes a resolution, while only 8% of those who make Near Year’s resolutions actually reach their goal. 25% of those who make a resolution claim defeat after just one week! WOW! That’s a lot of people who make a resolution but don’t continue to follow through to reach their goal. Here are my tips to make realistic New Year’s resolutions for 2014. Your resolution can be anything that you realistically want it to be. Maybe you want to lose weight, eat more healthy, learn something new, quit smoking, be a better person/parent/family member and so on. 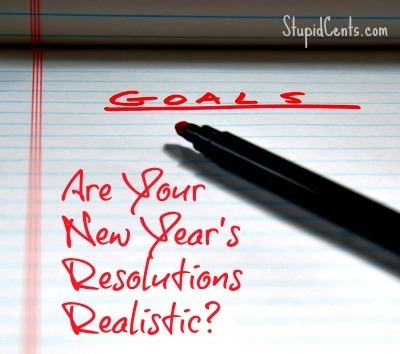 In order to know if your resolutions are realistic, you will need to create an action plan. What is your time frame for reaching your goals? What do you need to do to reach them? I am guilty of constantly making goals but not looking back and seeing what those goals actually are. So, after a few months pass, I completely forget about the goals that I have made. You also want to keep yourself accountable and track how you are doing. Maybe you could have a notebook detailing your process or even start a blog. Having a partner can do a lot to keep you motivated. If you have someone else who is trying to accomplish the same goals, it can create a little healthy competition, as well as give you someone to report to. For many goals out there, I’m sure that there is someone out there who might want to do something similar. You could find a gym partner or someone to do yoga with. This could be a friend, family member, or maybe you will even hire a gym trainer. You might think “oh, I can just take the next 3 weeks off.” However, don’t do that! Many people who create breaks like this never continue because it can be hard to get back into a regimen once you stop. A good way to keep yourself motivated is to create rewards for your goals. Maybe you could create mini goals to help track your progress and continually give you motivation. Or, maybe you could create one large goal for you to work towards that will lead to a large reward. An example that I have seen of a reward is related to a fitness-related resolution. You would add $10 (or any amount designated by you) to a jar for every pound that you lose. Then, once you reach your goal amount, you can then take the money and use it on a splurge for yourself (maybe a better fitting top?). If you have enough, you may be even able to reward yourself with a whole new wardrobe. What are you trying to accomplish in 2014? I decided to keep my resolutions a little more on the simple side – just don’t gain weight and I’m good! In all seriousness, eating healthy, improving relationships and finding a good apartment are mine. Good article! Every year, I like to dream really big, like I will get out of all of my credit card debt-which really ins’t possible when you do the math. I am going to try and aim for small attainable goals this year.